US radio talk show host Sandy Boyer (SB) interviewed Bernadette Devlin-McAliskey (BDM) about this weekend’s Bloody Sunday March in Derry. The following is a transcript of that interview, which also ranges over other matters. SB: We’re going over to County Tyrone, Coalisland, Co. Tyrone to speak to Bernadette Devlin-McAliskey. Bernadette, thanks very much for being with us. BDM: Hi, Sandy. Thank you. SB: And Bernadette, forty-one years ago on January 30th 1972, you were at the civil rights rally in Doire. You were on the platform when the British paratroops opened fire and killed thirteen people. And now forty-one years later you’re going over to speak at the rally that the relatives are organising. Tell us a little bit about that. BDM: Well I think the history of Bloody Sunday itself is well known and then following that the very, very long battle to try and discover the truth of the government action on that day and to clear the names of the dead from the responsibility placed on them for having been accused of participating in unlawful and violent behaviour and basically causing the event. People are also I think familiar that after a very, very long campaign of over thirty years the British government set up a public enquiry which itself then became very controversial. An enormous amount of public funds was spent on the enquiry. Most of it necessitated by the amount of money it required to prise the information out of government and government agents in order to bring it forward to a government financed enquiry. At the end of the day Lord Saville did report and he exonerated all of the dead from any unlawful or violent behaviour. And he placed the blame for Bloody Sunday on the soldiers on the ground on the day and on one or two of their commanders at a lower level. Many people immediately following that were caught up in the euphoria of finally being able to: a) to be able to get a verdict on the innocent victims ... the thirteen people killed on the day and (b)) to have an assertion - finally, publicly - that the people on that day were exerting their lawful and peaceful right to assemble and to protest against the actions of government. But from my own perspective, and I think it’s important to say that Sandy, from Bloody Sunday itself I was one of the very few people never to call for a government enquiry. I didn’t call for it and I never supported the call for it. I respected the right of the relatives to do so because I believed that the government at the highest level was implicated in that decision, that it was a war crime and that Britain should have been held to account at The Hague where governments are held to account for crimes of that nature. So as the years have gone on it has become increasingly clear - and Saville was limited and couldn’t find some of the information (of course, he didn’t look) - that would have implicated very high ranking members. And we’ve seen now things that we now know that we didn’t know then around the Pat Finucane inquiry and the importance and the role played by MI6 and MI5. A number of the families continue to protest. The majority of the families have supported a Sinn Féin position that Saville basically draws a line under this. But there are many people who still, and I include myself there, who still demand to know what was the role of government because the blame for Bloody Sunday has been basically left by the government on the foot soldiers that they sent in there and the result, as it stands, quite a body of evidence to show complicity of government but it was never examined by Saville. SB: Well why is it that have Sinn Féin and some of the relatives have said: no, let’s put a line under this, it’s over, we got an apology from David Cameron, let’s just move on? BDM: Well I think that a number of public enquiries became caught up in that. You know it’s difficult to set it out there because the importance of closure and the importance of answers to victims can’t be under-estimated. But justice is not the sole terrain of victims. The whole of society needs to have justice and needs to have truth. So while, if you’d like, the verdict of innocence for all of the civilians killed was a great relief to the families and allowed them closure, it became a sort of thing that the families could then in a way, dictate the pace to everybody else. And so when the majority of the families were happy with the outcome for their particular family it made it easier for politicians then to avoid the more embarrassing bits that will inevitably come to play - that the political organisation of Sinn Féin, which was the political leader, the single biggest political leader of the struggle and the resistance, is now in government - and through time will find itself to be in government and in administration with a government that has apologised left, right and centre but not for what it actually did and for what, in all reasonableness I’d suppose when you look at it, continues to do. Because if we look and we come right up to now...just today I saw in the newspaper things that have become commonplace, Sandy. You look at the newspaper today and you read that the Lord Chief Justice, who now is not a member of the old aristocracy, the old British, the Protestant ascendancy - he’s from Saint Malachy’s old boys - he’s the Catholic intelligensia in government and in high places - and the Chief Justice has put a reporting ban, a public reporting ban, on three re-trials, we don’t even know which they are but three re-trials and that’s where the court, where convictions have been overturned as unsafe and the people have been sent for retrial - there’s going to be no reporting - even as to what the trials are - until they have been adjudicated upon. 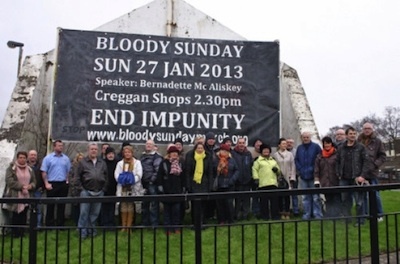 There is now, which is my other reason for going to Bloody Sunday, is there is now less room and less tolerance by those in government, including those in the Assembly and the Executive, for any opposite voice, any voice of opposition, any dissenting, any critical voice to the status quo or to the government line. And these are very dangerous times. And you see the first of it when you see riots in East Belfast. BDM: Well, of course! Sectarianism raises its head again and the flags dispute in Belfast has enabled us to see just how fragile and contrived the new dispensation that they speak of actually is. And I’ve been saying that for some years; in fact I think for about fifteen. And when you say that people then say: Do you want to go back to war? No! If you speak out loud then, if you voice any critical analysis of what is happening, you are accused of taking people back there. But it is the pretense that we have a settlement, the pretense that we have a justice, the pretense that we have a future that we do not, that is bit by bit being laid bare and these are very dangerous times. SB: Bernadette, speaking of very dangerous times, we have a situation where Marian Price and Martin Corey are in imprisoned indefinitely without a trial and no release date. SB: There’ve been protests but nothing has happened. BDM: Yep. There are a number of things and I suppose that may be a longer conversation, Sandy, about how this process has been put together and how the slow realisation, particularly of people within Sinn Féin as an organisation, the very, very slow, fragmented realisation that this is not what they wanted or not what they thought it was, has allowed the fragmentation of that movement in various steps. So that when you have things like virtual internment without trial, when you have the deterioration of the rights and conditions of prisoners, when you have the conviction of Brian Shivers overturned - the man refused bail and put on trial again which is what’s happening - you have a whole series of things against - as well social and economic austerity, increasing poverty, cuts in the welfare and health systems - you just say why is there no coherent organisation against it? And it is because, and I said it when the framework documents many years ago were sent out, the British policy here was not peace - it was pacification, demilitarisation, demobilisation and demoralisation. And the people who are suffering from the political, social and economic ills are so fragmented amongst themselves because each of them pulled out of the process at a different stage and none of them trust each other. SB: But Bernadette, if we give Sinn Féin complete credit for everything they say - and they have protested for Marian Price, they have protested for Martin Corey - you’d have to come to the conclusion that they’re powerless in this administration. BDM: Well, exactly! And I think that is the position that we have come to. The British administration have extracted all they can from a compliant parliamentary nationalist position of both the SDLP, which is now a minority position, and Sinn Féin so they have nothing else with which to negotiate. And Sinn Féin may have forgotten who their adversaries were but they’re very foolish to think that a British Empire much older than their little upstart selves would forget so quickly who Sinn Féin were. SB: And now we have these Loyalist protests in Belfast mainly, which have paralysed the city and cost the merchants tens of thousands of pounds and neither the established Unionists nor Sinn Féin nor the SDLP seem to be able to do anything about it. BDM: Well, it’s interesting to see how that comes. It’s ironic to see Loyalists in the ghettos of East Belfast shouting “PSNIRA”, accusing the police of being supporters of the Republicans when there’s no evidence of that. The police have been afraid to control the demonstrations and therefore, despite the fact that they are unlawful assemblies the legislation around unlawful assembly has not been used and they haven’t been dispersed. They have been allowed to, in an exercise of what is called “peaceful protest”, they have actually been allowed to intimidate the police. The thing was started by Mike Nesbitt’s Unionist Party and Peter Robinson’s DUP in an effort to create a crisis that would expose the Alliance Party. And they were so out of touch with reality because they believe in this contrived peace process that they didn’t understand what they were actually doing and they unleashed this on the streets and they can’t control it. It’ll be interesting to see how, when the marching season comes around, the police tactics as used today will then be able to be changed in order to control much larger manifestations of marching and flag waving and what we see from that and what we can particularly see in the whole confusion and inarticulate rage of people, which is a very, very small grouping, but it is a reflection of a reality that while it’s being portrayed differently, because there’s always been much more political oganising on the Nationalist side, you have the leadership of Unionism and Nationalism basically closeted into a sectarian, a management of sectarian divisions, around a peace process - and there’s always a management of sectarian interfaces. And at the top benefiting from it. And on both sides you have the people who’ve gained nothing from the peace: the poor - the working class Loyalist - the poor - the working class Nationalists. And sooner or later, Sandy, somebody’s going to have to realise that it is the ideology of Unionism and Nationalism that is flawed. Sooner or later we’re going to have to have conversations about class interests and imperialism. SB: Well, we will await that day. SB: We have indeed and some of us have been talking about that for a long time especially yourself. And Bernadette, thank you very much. It’s always a pleasure. BDM: Thank you, Sandy. Always good to talk to you.